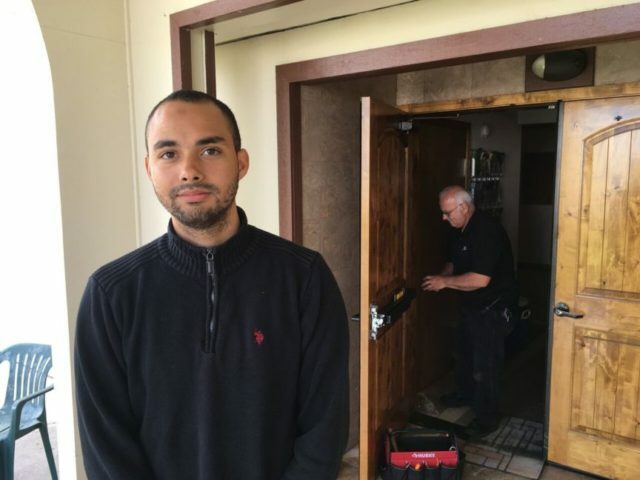 Mosques are getting visits from locksmiths who are upgrading their mosques with better locks. They are higher grade locks that were requested for installation on the front doors. Why the sudden upgrade in security? Well, the mosque leaders are getting very worried for one. Worried about their security. At one such mosque, a man appeared outside and threatened to kill Muslims. Then under two weeks later, an assailant stabbed two males to their death and wounded another inside a commuter train in Portland. The victims were trying to protect two teenage girls, one of them in a hijab, as the attacker shouted anti-Islamic slurs. Now, we have anti-Shariah/Islamic law marches planned to hit this Saturday in Seattle and about two dozen other cities across the U.S. and Muslim leaders are getting nervous. They are saying that the marches are not anti-Shariah law, but that they are anti-Muslim. Using the two incidents just described as a basis for their claim. Yet many Muslims and others say the group promotes a distorted and prejudiced view of Islam. ACT for America activists portray Shariah as largely incompatible with American democracy and often warn of a stealth effort to replace U.S. law with Islamic law. Muslims call the claims ludicrous and say Islamic law plays a role similar to Jewish law, as a guide to religious life rooted in the Quran. She said she has noticed increased hostility toward Muslims, evidenced by the destruction of a granite sign in front of the mosque she attends in Redmond, Washington, by someone apparently wielding a sledgehammer. A temporary sign was destroyed a few weeks later. Two far-right groups, the Oath Keepers and the Three Percenters, are to provide security at some of the rallies, apparently the first simultaneous anti-Shariah rallies in the U.S. Members of a third group also confirmed they’ll attend, according to the Southern Poverty Law Center, which monitors hate groups. “With the recruitment of anti-government groups and the Proud Boys, the potential for violence increases,” the center said. “Many people are worried and saddened and very shocked, but we still hope to be able to practice and to be part of the Eugene community,” Williams said as the locksmith worked next to him. On top of installing stronger locks, the mosque is also putting together and raising funds to build a wall around the building and possibly hire security guard for the days that their number of worshipers peak. So, Muslims are worried about people protesting against Shariah law. Perhaps Muslims should find a new prophet to provide a new 2nd half of the Koran where Allah changes his mind on things. Compromise….sound good?